Have you noticed that there's more stuff than ever being pushed out via email, blog articles, social updates, etc. that pretends to be about customer relevance when it's really just content without relevance or context? What's worrisome is that those sending all of that stuff out think that they are creating a connection with the recipients. How do you create customer relevance? Let's be real. Pushing tons of messages doesn't do much for developing a relationship - especially if those messages don't hold much interest. Because to build a relationship with customers, prospects or fellow professionals, you need to embrace content + context - or context marketing. That's how you create customer relevance. If you don't, there's no context and definitely no relationship. It's becoming a bigger and bigger deal. Customers are getting inundated with messages they aren't interested in. Mostly because they receive too many messages about what companies want to say, rather than about what they want to hear about. That's a major disconnect. It's traditional marketing pretending to be content marketing and it creates clutter and noise. As the messages pile up (and clog their email inboxes), recipients have a choice. Ignore, unsubscribe, or mark as spam. None of which do much to help businesses generate business. Sadly, generating mass messages that have little of content + context is a sign of companies getting caught up in numbers - in publishing stuff for the sake of publishing it rather than to add meaning or insight. 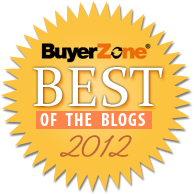 It's blog articles that barely skim the surface of a topic. It's a dozen daily emails about a sale on an item you've just purchased and won't be consuming for another 2 years. It's website updates that go on and on about how wonderful your company and people are. It's a retail store which pretends to be socially committed, yet won't respond to customer questions or complaints. There is a better way to build customer relationships. Think content + context! For those committed to building relationships based on customer relevance, content marketing remains ever more important. They are the ones publishing valuable resources and how-to articles which acknowledge customer questions. They are the ones sharing insights about the greater conversations taking place, and the ones encouraging and supporting others. They do so by blending content with context and connecting with customers because of shared passions, interests and insights. It's not that foreign. When you meet someone for the first time, you listen carefully for what's of interest to them and what overlaps with your interests so you can share meaningful conversation. The more meaningful, the more memorable the interaction. The more memorable, the more likely you are to continue the conversation over future interactions. So, in the digital world, if we're tring to create customer relevance, we need to make an effort to understand who our customers (or prospects, visitors, readers and connections) so we can offer them truly remarkable content which has meaning for them. If it does, we have a chance at engagement. That effort - BTW - signifies that we are open to building those relationships and willing to interact as individuals in person, via Twitter chats, and in blog comments. The greatest challenge for organizations is figuring out how to connect with customers as individuals when the corporate preference is to focus on the greater entity (aka the brand) and minimize the individual. In this socially networked world, the more we are comfortable with people and the individual entity, the more powerful the connection for the business. With that in mind, I'd like to call attention to professional individuals I admire who do an incredible job creating content + context. They constantly elevate the conversation and encourage us to think about creating customer relevance and determine how to build those meaningful relationships without which we are nothing. Nora Depalma from O'Reilly/DePalma who constantly sets the stage for social engagement on every social network she engages on. Arnold Waldstein who, with every blog article he publishes, inspires his readers anew with ideas about community and relevance. 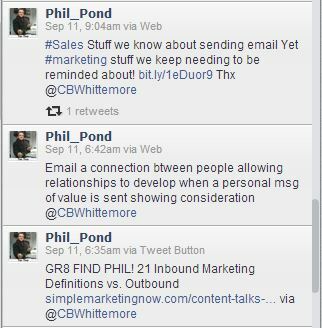 From across the pond, I really appreciate how Phil Pond connects via social networks while making each connection feel really good. Toby Bloomberg (aka Diva Marketing) constantly adds meaning to connecting online. 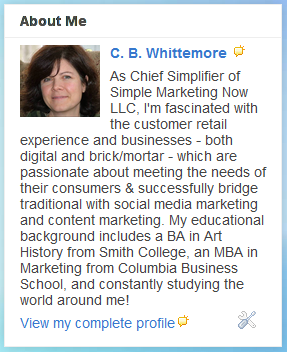 She recently posted Social Media "Pioneers" Tell Why to capture why many early social media participants got started. (I'm honored to be included.) Whenever Toby publishes this type blog post, she reminds us of what is at the heart of connecting socially: content + context. Veronika Miller from Modenus has created a powerfully relevant venue with BlogTour which brings together designers and industry sponsors. The result: strong relationships, relevant content, shared context. I'd love to hear your reactions to the content you receive. Is it brilliant? Does it miss the mark? Does it make you want to connect? Do you find it relevant? Let me know in the comments. 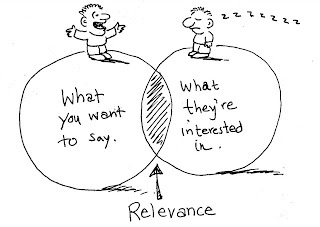 Image Credit: On romanace, relevance and rankmaniac found via What is the key to relevance in email marketing?